One of the most seemingly contradictory, but undeniably effective, construction marketing ideas, is to put aside marketing your own services, and instead focus on community initiatives within your market community. In other words, instead of trying to promote your own business, support actively the promotion of worthy causes and organizations where your clients and potential clients are likely to associate. This generosity has surprisingly strong direct and indirect advantages. First, by associating with good deeds in your community, you enhance your brand, if “brand” is defined by trust. After all, if you are associated with the welfare and best interests of the people you want to serve, then clearly you’ll experience higher trust levels. However, the other aspect of the community service effectiveness arises when you put your time more than your cash into the projects — actively engaging in the initiative — through committee, task force and organization board of directors participation. Here, you transcend marketing to business development, by forging close personal relationships in many cases with community leaders and successful potential clients. The important point here is that you must conduct your communtiy service without expectation of reward. In other words, if you even think there is “something in it for me,” you will fail, because people will see through your insincerity and selfish motives and want to run for the hills. 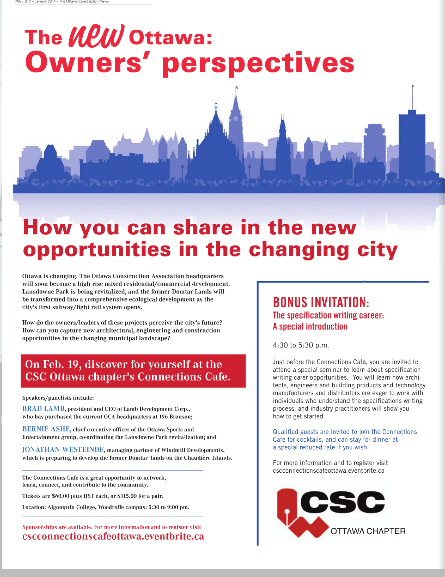 A good example of community involvement for which I have responsibility is the Construction Specifications Canada Ottawa Chapter Connections Cafe, scheduled for Feb. 19. I was able to line up three high-profile owner/developers to speak about their perspectives of the city. The fact they are owners and leaders of projects with potentially billions of dollars in construction activity means that quite a few people in the AEC community here would like to see them. I doubt I could get them to speak for a commercial gathering/business and I don’t care if they decide or decide not in the future to support some initiatives relating to my own business. Instead, I’ll measure success through ticket sales, for which all revenue will flow through to the CSC chapter. Of course, I have a committee helping me on the work, and the event venue and other contractors will do their jobs to minimize stress and time loss. When the evening has concluded, I expect if we put a tracking code on things, we would find some worthy business results for Ottawa Construction News. However, my success measure will be much simpler: How many tickets do we sell; how much does the association raise for its objectives, and how satisfied were the participants with the experience? It may seem counter-intuitive to put aside your own business interests in planning a community marketing strategy, especially since your objectives should always be for the community not your own business, but I know of few more effective and rewarding marketing strategies out there. Do you have community service initiatives you would like to share? Make a comment or email me at buckshon@constructionmarketingideas.com, and I’ll see if I can help out with some free publicity for you.